One of the most recognized and respected name in child-safety products is Britax. Their car seats regularly receive top marks from the government agencies that test and review safety seats. The Britax B-Safe 35 Infant Car Seat is one of their top car seats when it comes to its structure and ease of use. You can rest assured that your infant will be safe when strapped into this properly installed car seat. Along with all of the safety features, this car seat is also part of a large Britax travel system. 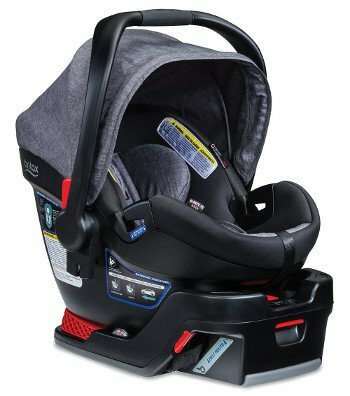 This infant car seat stands apart from the rest because the Britax designers figured out how to make it easy to install. This rear-facing car seat comes with a base and carrier designed for comfort and impact-resistant safety. 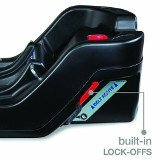 While many infant seat bases are confusing to install, the Britax B-Safe 35 is not confusing at all. The base has center-pull straps and push-button LATCH connectors so you know immediately if the seat is safe and secure in your car. Detaching is just as easy – you can remove the entire seat with a push of a button. The car seat is appropriate for infants who weigh between 4 pounds and 35 pounds. The maximum height for infants to ride in this seat is no more than 32 inches tall. The base weighs 20 pounds. The carrier weighs 10 pounds. The base width is a compact 14 inches. The widest part of the carrier is 18 inches. The overall length of the car seat is 26 inches. 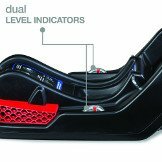 Britax added the SafeCell Impact protection to the B-Safe 35 Infant Car Seat. 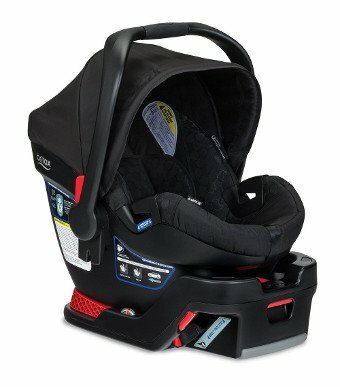 This feature is only in Britax car seats and includes a steel frame in the carrier that offers outstanding strength. The SafeCell feature also include an energy-absorbing base that is designed to compress in the case of a collision. The other feature that separates this car seat from the rest is the SafeCenter LATCH system that makes this seat one of the easiest to install. 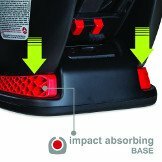 The base uses the LATCH system to stay safely in place in the backseat of your vehicle. 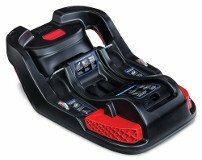 You can be certain the car seat is exactly where it needs to be with the connectors and the push-button system. You will know the base is installed properly by checking out the base recline indicator that uses a pendulum on both sides. The B-Safe 35 gets top marks for easy installation, which for some parents can outweigh many of the small issues that sometimes arise with this car seat. If need to use the carrier in a car that does not have a base, you can use a car seat belt to keep your baby safe while on the road. There are large side clips that make it easy to thread the lap belt through and the car seat sits at an appropriate angle when installed without a base. Many other car seats need a rolled up towel or blanket to get the car seat at a safe angle. One design feature that could be better was the harness for the baby. The harness is perfectly safe, but the textile that Britax used is rather stiff, which can make it a little challenging to tighten. The harness can be adjusted with four different positions, but the harness cannot be adjusted with baby in the seat because the straps must be adjusted from the backside of the carrier. The strap at the crotch has two positions, but they provide enough variety for the right fit for babies who are within the height and weight range. Another nice feature is the click that sounds when the car seat is securely in the base. There is a big handle on the backside of the carrier that releases it from the base. The carrier handle can be adjusted and rotated for comfort. The handle can be safely in one of its four positions while driving, so you can put safe toys on it to entertain baby while on the road. The handle does not rub on the canopy, which is a feature that most other car seats cannot claim. 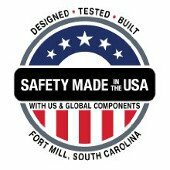 Side impact protection with SafeCell that exceeds federal safety standards. Impact-resistant foam in the carrier. Large canopy for protection from the sun. This attractive car seat has a contoured shell that protects baby and reduces the amount of side-to-side movement that can happen while riding in the car. The cradle of the shell keeps baby’s body securely in the car seat for maximum protection. The car seat cover comes off, so it can be cleaned. But, the car seat cover can also be wiped clean while in place. The adjustable handle makes it easy to carry baby to and from the car. The LATCH system makes the base easy to install and the big release button lets you easily remove the carrier when you arrive at your destination. The rear-facing base comes with a level so you know your baby will be resting in a comfortable position. The car seat is airplane compliant, too. There are several accessories that can be used with the Britax B-Safe 35 Infant Car Seat. If you use the travel system, you must purchase the Click & Go Adaptor so the car seat and stroller can fit together safely. If you have more than one vehicle that baby will be riding in, Britax offers a second base at an affordable price. The second base has the same safety systems and the same easy LATCH installation. Another useful accessory is the Back Seat Mirror. Parents appreciate being able to see what their babies are doing when they are riding in rear-facing seats. The Britax mirror has a soft frame, shatterproof mirror, and straps that make it easy to install in cars. Parents in sunny climates like the EZ-Cling window shades that help keep the sun out of baby’s eyes as they stick to the side windows in the rear of the car. Even though the B-Safe 35 has a large canopy, the sun can still make baby uncomfortable. Parents also appreciate the pieces that fit inside of the carrier. The head and pillow support and the seat protector offer a few extra levels of comfort for baby and protection for the car seat. Babies are messy, so the waterproof seat protector keeps spills and leaks off of the car seat cover. The head and pillow support add comfort, but they can also help keep spit and drool off of the car seat itself. Britax also has an All-Weather Car Seat Cover that is helpful for parents who live in climates that get all types of weather. This cover provides a weather-resistant canopy and a cover for the rest of the carrier. It protects baby from the elements and has a mesh insert that is covered by the canopy so baby can stay cool, too. If you prefer a more specific cover, Britax also offers rain gear to keep baby dry on rainy days. The Britax B-Safe 35 Infant Car Seat is a favorite with parents who like its attractive design and high quality safety features. The car seat is easy to install, and has some of the highest ratings for the ease of installation when compared to other brands. It is part of the Britax B-Agile & B-Safe 35 Elite Travel System, so parents can use the car seat with a useful stroller. While the car seat is not perfect, the flaws are not safety related. Most of the flaws are in regards to adjusting the harness and the smaller size of the cradle in the shell. Britax has several useful accessories that add to the durability and usefulness of this car seat. If you are looking for a infant car seat that offers a high level of safety, the Britax B-Safe 35 Infant Car Seat is a great choice. I found when this base is installed properly so that there is less than an inch of travel between the base where it sits with the vehicle seat, there is the chance of the leveling feature to skip it’s track. It has happened to me twice, one time the tabs on the adjustment lever snapped off and I had to spend another $125CAD for another one. It is and design and Britax won’t acknowledge it or are even willing to exchange it for you. Hi Peter, we’re sorry to hear of your bad experience. It’s hard to say whether the product has a design flaw or whether it’s incompatible with your particular vehicle. We recommend looking at other seats in your price range that we rated higher, such as the Chicco KeyFit, Evenflo SafeMax and Peg Perego Primo Viaggio. These are all high quality seats. The Peg Perego has performed excellently in real crash situations, while the Chicco KeyFit has the benefit of ReclineSure leveling that helps a lot in adjusting the seat to various backseat designs in different vehicles. See our detailed reviews for more information/videos, etc.